Born in Israel and raised in Seattle, Noa is an NYC based theater and film actor. Ever fascinated by movement, Noa spent her childhood and teen years studying classical ballet. She participated in her school's rowing and cross country running teams in addition to dancing her heart out on stage performing in musicals. In 2013, Noa accidentally fell in love with the GYROTONIC EXPANSION SYSTEM® in her search to manage chronic pain from an injury. The system not only allows her to live pain-free but continuously enriches her quality of life with its ability to heal, strengthen, and build a sense of freedom in the body. Although her studies of GYROTONIC® initially focused on self-practice, Noa soon realized how much joy it gave her to share the method with others. The ability to work with someone for an hour knowing they will leave lighter, longer, calmer, and more open and at ease in their bodies than when they came in can be very empowering. Noa received her foundation studying with Billy Macagnone and Patricia Stewart. 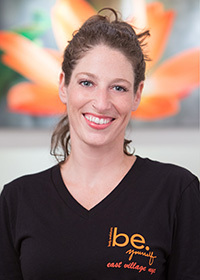 She is a certified GYROTONIC® instructor (Angela Crowley) and an Apprentice GYROKINESIS® instructor (Miriam Barbosa). Also certified to teach on the specialized equipment: Leg Extension (Miriam Barbosa), GYROTONIC® Level 1 as a Musical Journey (Billy Macagnone), Applications for Dancers Part 1 (Miriam Barbosa), and Applications for the Shoulder Girdle (Uwe Herbstreit). A special thank you to Billy for creating such a wonderful studio and to everyone on the BE team for your passion, knowledge and beautiful energy.